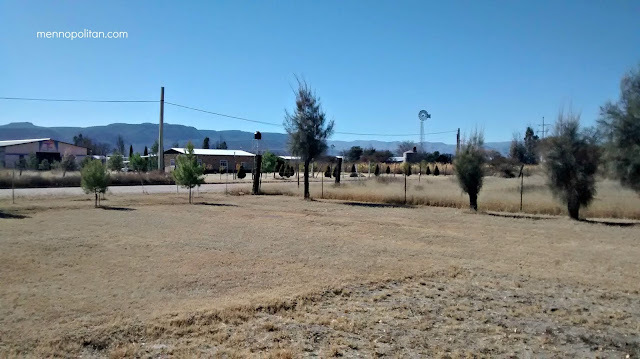 Mennonite colony in Nuevo Ideal, Durango, Mexico where I grew up. “Hey, Anna, how are you?” asked George. As he began talking, I sat down and thought, oh no, here we go. I got really nervous and began shaking again. I hung up the phone, went and got myself a blanket, lay down beside Christina, and said every single prayer I knew. Once for saying a bad word, once for thinking about kissing George, once for tricking the cowboys. I opened my eyes and stared at Christina’s face for a while as she was snoring, and thought how glad I was that out of all the friends she could have stayed with, she asked to stay with me. That made me feel so much better about all the times I felt like such a useless friend. The next thing I knew, I woke up to the sound of the shower and I had to think really hard to figure out what had happened and what was going on. When I realised that Christina wasn't there I knew that it was her in the shower. I lay back down, remembered my award, and just stared at it with a smile on my face. But that smile turned to a frown as soon as I remembered Aaron. Christina came out of the shower with her hair wrapped up in a towel. I got so excited and shouted, “YES! I do, I just have to shower first.” I ran, showered, put my favorite jeans and t-shirt and some lip gloss on and I was ready to go. While I was in the shower Christina had called her mom to pick us up and drive us to her car. “Well, I’m glad that she has a friend like you. Have fun shopping, you too,” her mom shouted as I got in her car. We drove to Tim Hortons, bought ourselves large coffees, and drove to White Oaks Mall in London, the biggest mall I had ever seen. We walked in, and the first thing I saw was this huge Christmas tree. I couldn't help myself, I just stopped and stared at it in awe for a while. We had to be so careful and watch where we walked, the mall was as crowded as the club that we went to the night before. Seeing all those people reminded me of everything that happened the night before. I wondered how pissed off those Low German cowboys could be at me after what I did. I still felt so anxious about that whole night while walking through the crowded mall. Thinking about going to grade nine, and feeling terrified and butterflies about that at the same time. I tried to just keep remembering that I wasn’t a hard learner anymore. I had a hard time enjoying myself walking around in that mall. Not even the Christmas music playing in the background was helping to distract my thoughts. I just smiled and looked down, I had no idea what to say to that. Other than Bree no one had ever even noticed my eyelashes before, let alone been that excited about them, especially a man. I just stared at him. He was wearing dark blue jeans, a white button-up long sleeve shirt, a black vest with light pink polka dots on it, and a bright pink tie. “It’s okay, Josh, you're not the only one. I’m still confused about this, too. I’m some kind of Low German Mennonite that happened to be born in Mexico,” I said. “No, I won't. I look terrible. If you put those new clothes on me you would ruin them. Anna should try them on.” And she started crying again. “Wait, Anna, would you actually want to go there?” Christina asked. “Anna, I have to tell you, ahhh…” Christina started, but Josh interrupted her. I said “Okay” with a big smile on my face and followed Josh while he picked out some outfits for us to try on. I picked a black lace top that had a solid tank top under it that I thought would look nice with my jeans. Josh talked Christina into buying a short green dress that looked amazing on her. “What do you need, Anna? What else do you want to buy?” Christina asked as we walked out of the store that Josh worked in. We went to WalMart and she helped me pick out a toy for each of my siblings, a couple of boxes of chocolate, a big jar of peanut butter, a black sweater for my mom, a plaid button up shirt for my dad, and a diaper bag for my married sister. When we walked out of the mall it was snowing heavily. The parking lot was covered in fluffy white snow. We put all the bags of stuff in the trunk of her car and drove to Josh’s apartment in downtown London. We took our new clothes and ran up the stairs to his apartment. I was amazed when we walked through the door -- his apartment was so clean and neat. Everything was black and white and it smelled like lavender. It was so cozy. The carpet was fluffy and white. His black sofa had white fluffy pillows lined up neatly against the back of it. There were a couple of fuzzy white blankets folded on each end of the sofa. I was especially excited about the big stack of magazines on the glass coffee table in front of the sofa. Christina and I sat down on the sofa, looked at each other, both let out a big sigh and snuggled up with the pillows. We just sat there and stared in a daze for a while until Christina got up and ordered pizza. “What?” Click here to continue reading my story.